This week’s vote of no confidence has no constitutional basis. We’ve had enough of top-down stitch-ups by the elite, whether corporate or more overtly political. It is time for people power and now we have the technology to facilitate new participative processes. Good points Rhea and I am voting for you as well as the rest of the NEC left slate. Well said Rhea. 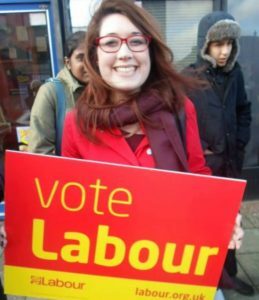 Hope you have been notified by now that my North Shropshire CLP voted to support your NEC candidature on 17th June . I’ve heard Rhea a number of times this past week doing phone-in interviews for LBC about the failed coup and she has come across really well in them and impressed me a lot. I really hope that young comrades like Rhea will now be the foundation for a rebuilt Labour Party in Scotland, particularly if she gets the place on the NEC she deserves. As for Momentum, yes I agree with Rhea that it does have a transformative potential, however only if it can develop into an inclusive, vibrant democratic grouping itself. I know that there are fears of it being destabilised by some of the ultra-left external sects, but we have the numbers to make it work properly and combine a mobilising role with a theoretical one in developing socialist ideas for the 21st century. Thanks Rhea. Please keep up the good work. I am a member of Momentum Plymouth. It’s very important to have a movement which gives voice to the people who otherwise would not be heard due to the control of the main stream media by large corporations and politically biased organisations, not to mention the Murdoch press. Our values are the true values of the Labour Party, we are True Labour. The likely result of any accomodation with the 170 is that membership of the Labour Party will plummit. If the plotters win and gain control over the party recognised members of Momentum will be expelled and Momentum proscribed. ( unless of course it does not become a bother to the party) The duty of Momentum is to keep those that voted Corbyn and a new style of politics together. The problem is now that we all know that the coup plotters even if they cave in now will, if Jeremy leads the party to victory in the next general election, refuse to form a government under him and are more likely to bloc with the Tories to form a government of national unity and austerity. They have to go and if they cannot be de-selected then candidates should be stood against them who are pledged to help Corbyn form a government. What do Momentum plan to do on this front? Anything? … they [Labour MPs] do not have the right to hold our party to ransom, they do not have the right to abandon the country when it is in desperate need of leadership, and they do not have the right to use bullying as a tactic to get their own way. They do not indeed have those rights but it is now crystal clear that the majority intend to proceed on the assumption that the have those rights. That is the reality which we now have to deal with. I would like to know more about how it is that so many centre and left MPs have been drawn into this. I have not yet seen an attempt to explain that from a left viewpoint. I would like to know if anyone has seen something on this. Yes this is the really interesting and important aspect of it. Obviously people who can be manipulated in theis way by the pied pipers of the Blairite and right are not entirely reliable employees but they do need to be worked on and allowed some partially face-saving way back. I have no doubt that the main factor is simply the ostrich-headed desire to ‘make it all stop’ and avoid a split. The coup plotters, in standard fashion, would like to make their own actions seem inevitable or reasonable or something hazily in between, and make it look as though Corbyn is responsible for the chaos and strife they have unleashed. They will have a tough job doing so. When this is over, Corbyn will have proved his mettle and the plotters their venality. Whatever partial victory they may yet salvage looks like being distinctly Pyrrhic. Yes, the Graeber piece does help to understand the left and centre MPs who have been drawn into this right-wing maelstrom. I hope that this experience will encourage at least some on the left to reject the “gut socialism” that all too many on the left think is a good basis for radical politics. It might be a starting point but if its adepts don’t move beyond it then either they will follow a similar political path to the likes of Nye Bevan or Neil Kinnock or they will end up endlessly repeating the same simpistic notions and solutions.